192 other birds have this item in their bag or wishlist! Stunning and timeless. 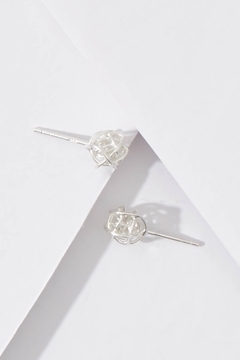 This is the only way you can describe the Tangle Small Stud Earring by Najo. Bought as a gift for my teenage daughter who is really happy with them. Just love these, very pretty. Love these. Get so many compliments. Nice - not much you can say about stud earrings. Absolutely love these studs! Can be dressed down or up. Wore them for the first time today and received multiple comments. They are 'small'....but lovely for any occasion. These studs are a little different and that's what I like. They are light in weight and big enough to notice. Sweet, simple and sterling silver. Super cute. Will go with anything. I purchased these for my sister for Christmas. They are very sweet and could be worn with dressy or casual clothes. I don't usually wear stud earrings, but I think these are my new favourites. I can wear them with casual clothes, work wear or going out. They are perfect! Absolutely love these earrings. Simple yet different and so versatile. Love wearing these and will get so much wear - thanks Birdsnest! Perfect size for my ear and add just a little bit of subtle bling for any occasion.